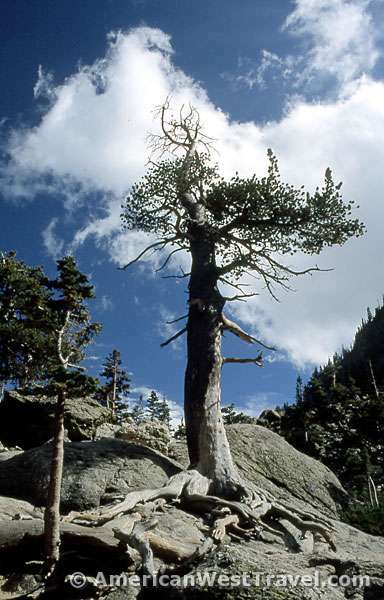 For obvious reasons, the trail to Emerald Lake (photo, above) is the most popular in Rocky Mountain National Park. 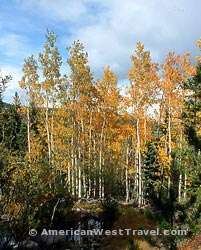 The trail originates at the convenient Bear Lake parking lot and climbs easily for roughly two miles to the lake and its spectacular vista. 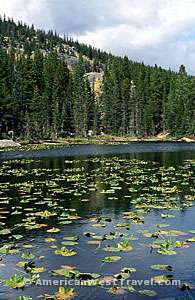 It also passes scenic Dream Lake and Nymph Lake along the way. (Photo Above): Flat-topped Hallett Peak (elevation, 12,713 ft, 3875 m) is at left, and jagged Flattop Mountain (12,324 ft, 3756 m) is at right. At left, a solitary tree stands up to the fierce wind on the eastern edge of Emerald Lake. 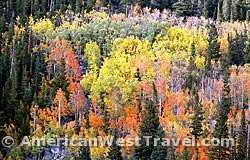 Weather is very unpredictable in the Colorado mountains, with summer often changing to winter in a single day. We had enjoyed gorgeous summer weather when we arrived at the park. When we did this hike the next day, temperatures had dropped from the 80°F to 40s°F, with rain and snow showers and constant high winds. The following day, we enjoyed even harsher weather on our hike to the Sky Pond. At right, lily pads on Nymph Lake. We did not bring winter gear but dressing in light layers was quite suitable, four layers of flannel shirts, sweatshirts, and sweaters. Key to this was our goretex-style rain gear which now proved its worth. 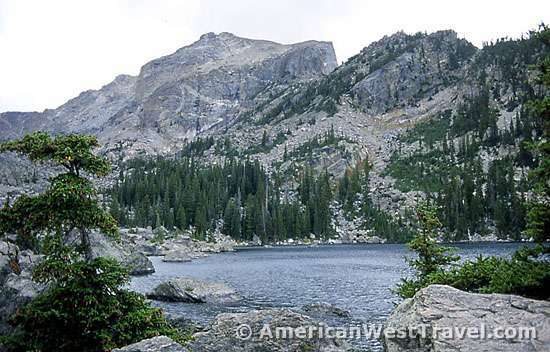 The well interconnected trail system in the Bear Lake regions offers many opportunities to easily see lakes, waterfalls, and lots of scenic views. On this day, we took a one mile side trip to Lake Haiyaha (photo, right), which offered beautiful scenic views as well as fall colors. 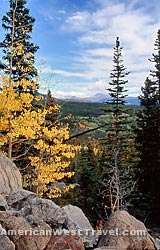 One of the nice aspects of the trail to Lake Haiyaha is the outstanding vista of Longs Peak, the highest point in Colorado's Rocky Mountain National Park, and the crest of the Rockies in the continental U.S. We obtained the spectacular photo below, which had beautiful foliage for good measure. The Keyhole Route to the summit of Longs Peak does not require technical skills after the snow and ice melts in July. But it is not "a walk in the park". 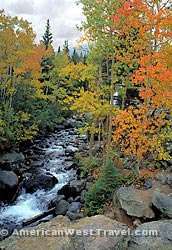 It is nearly a 15 mile round trip from the trailhead to the peak and back with an elevation gain of over 4,000 feet. 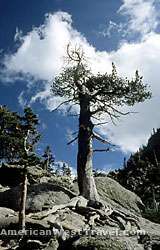 It is a Class 3 climb that crosses enormous sheer vertical rock faces, often with falling rocks, requiring scrambling, where an unroped fall would likely be fatal. The route has narrow ledges, loose rock, and steep cliffs. The terrain requires good route-finding and scrambling skills. The final approach to the summit is simply exposed, open slope, making it extremely susceptible to dangerous and frequent afternoon weather changes. The Park Service recommends a 3AM start to the climb in order to be off the high slope by mid-afternoon. Time for the 15-mile round-trip averages 10 to 15 hours. 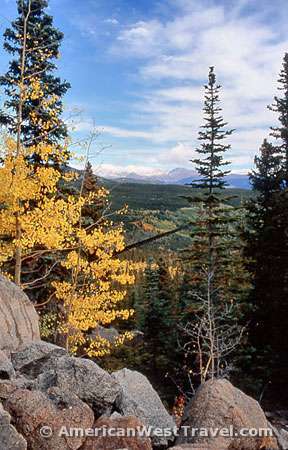 (Photo right): A closeup of Longs Peak from the Morraine Park Museum,with Pagoda Peak to the left and Storm Peak to the right. 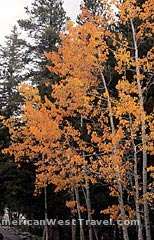 Below, some more fall color shots taken at Bear Lake and along the trails. 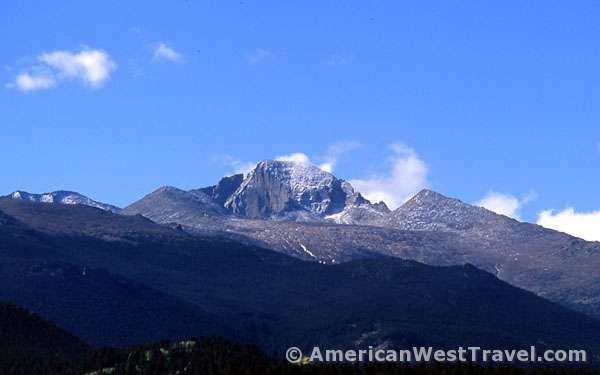 A Scenic Guide to 33 Favorite Hikes Including Longs Peak. 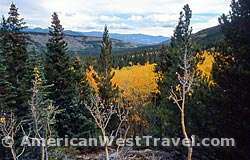 The only complete hiking guide to Rocky Mountain National Park! Grand Teton's famed vista at sunrise. Excellent large format. Waterton National Park, Alberta, Canada. Excellent large format. 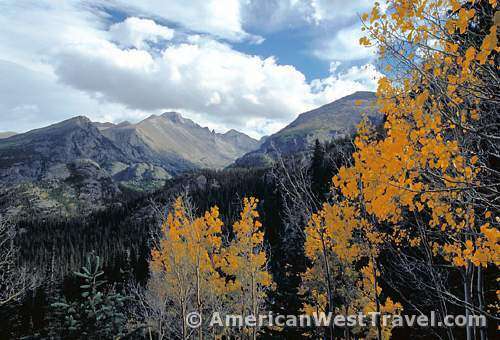 Rocky Mountain National Park offers the best of the "Front Range" in Colorado. 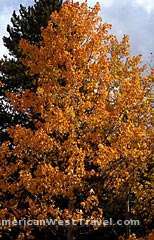 The other national parks of the Rockies are Grand Teton, Yellowstone, and Glacier. These parks highlight the northern Rockies. 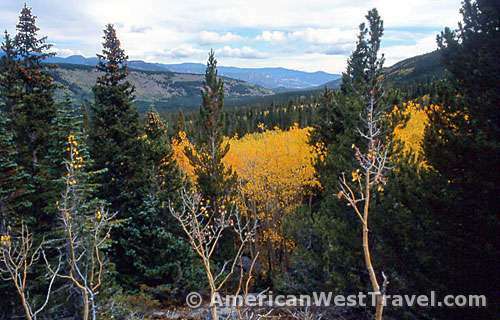 Rocky Mountain National Park is roughly 75 miles northeast of Denver, Colorado. Several routes access the park from Denver and Interstate-25 north of the city. Access is also available from Interstate-70.